Summary: This project is intended to become a monthly YouTube video series and potentially eventual fully-fludged fangame. I have a fully completed plot; now I am searching for voice actors, artists and musicians to fully flesh this series out and make it feel as canon as humanly possible. Sixteen students awaken inside Seigi Academy, one of the most prestigious schools in all of Japan. Maeko Takahashi, the Ultimate Journalist, must learn to navigate life within the hallowed halls when power is superseded by a mysterious new entity. The class is thrust into the Killing School Tournament, and as promises are broken, lies are unveiled and trust is betrayed, will Maeko be able to keep a steady grasp on her sanity or will she be claimed by the killing game? Voice actors with a varied range - these characters will naturally experience a wide variety of emotions. Interpreting the given lines in your own way gives me a much clearer view of whether or not you may fit a character, and is greatly appreciated, as is ad-libbing. Voice actors will be cast when I feel the proper voice is found - there is no time limit in order to keep this project casual, and all roles are always available to audition for! Musicians- a team of people to help me create original music and songs for every aspect of this series, down to character theme tunes. 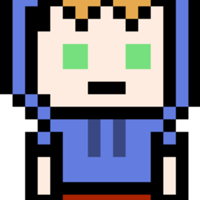 Artists- same as musicians, a team would be appreciated, everything ranging from character sprites (approx. 40 are intended for every character) to debate scrum sprites, minigame concept drafters, concept artists, and environment artists. Most visuals are planned, but I do not have the skill to draw them out and people with that skill willing to help would be greatly appreciated. NO TRACING WHATSOEVER - I don't care if it's a base, pose, or the angle of a limb, tracing is tracing, and I have a strict no-trace policy. The current headshots are traced from Danganronpa 33, by the owner of Danganronpa 33. 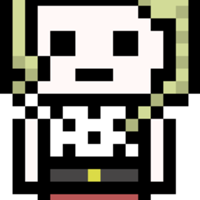 This is a slight loophole, as these are not the final sprites, and are still original in the sense that they are not being taken from any other artist, but this is the ONLY loophole of it's kind, and will not be present in the end result. Tracing is a serious issue and will not be tolerated. Danganronpa: Lock•Down is original - please do not attempt to tarnish its reputation with tracing. Editors- both video and audio editors, able to help put everything together for the end result! Maeko is a very blunt and forwards individual, who hates being in the spotlight. She was raised with standards of becoming a star but found herself pursuing what lay beyond the action instead. Being obsessed with celebrities and the culture that surrounds them, she finds it very hard to adapt to suddenly becoming one, and somewhat resents her Ultimate talent. Her voice should be medium in pitch, able to be both very awkward and quiet as well as loud and demanding as she adapts to her surroundings. By popular demand, the canon voice that she is most similar to is Komaru Naegi. (Peppy) Oh, I guess I should introduce myself. I'm a student at this high school, for some reason or another. The headlines call me the Ultimate Journalist: Maeko Takahashi. (Shocked) Kill... to escape? You can't expect us to just massacre each other! (Pushy) It can't be true! Ken is an optimistic and positive teenage boy with the title of Ultimate Choreographer. He tries to assume a leadership role but often fails in humorous ways. He is a bright light within the group and provides comedic relief. His informal way of speech is consistent, being very cheery, though he is able to act responsibly when absolutely necessary. He should have a medium to low voice, as though he hits high notes a lot this would become grating if he already spoke high enough. He is often loud and very expressive through his voice, changing pitch, pace and tone on a whim. 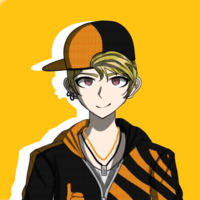 By popular demand, the canon voice that he is most similar to is Kazuichi Souda. (Cheery) Hey hey heeey! Ken-ichiwa~! The Choreographer is in the hou-ouuuse! (Calm) Sure, sure, the only way to escape is to kill each other... Wait, KILL EACH OTHER!? (Shocked) Whoa, whoa, WHAT!? I DIDN'T KILL THEM! Reiki is a very strict yet loving character with everyone's best interests at heart. She wants everybody to escape from the killing game alive and is willing to be rude or aggressive to reach this goal. She wishes she could be kind and attempts to be, but she is no stranger to being cold to get ahead for others' sakes. She should have a very mid-ranged and mature voice, probably with a calm tone as her main priority is to dispel the rage or anxiety of others. 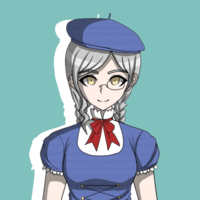 By popular demand, the canon voice that she is most similar to is Kirumi Toujou. (Calm) I am Reiki Kawaguchi, the Ultimate Spirit Medium. It is a pleasure to make your acquaintance ma'am. (Agitated) How dare you suggest that we kill each other? Our lives are sacred, you impudent swine! (Strict) Murder is unacceptable. I will never forgive this! Naoko is extremely blunt and generally quite selfish. She is commonly referred to as 'the human calculator' for her skills as the Ultimate Accountant. She is dull and hateful in a way that breeds both tension and comedy, and she refuses to allow any of her classmates to make a fool of her. She has a narcissistic core philosophy: always watch out for number one. Her voice should be mid to low and deadpan, though she is quick to scream or yell in anger when frustrated. By popular demand, the canon voice that she is most similar to is Maki Harukawa. (Cold) Naoko Shidehara. Ultimate Accountant. What did you expect? (Blunt) What do you want from me, you pathetic waste of space? (Aggressive) Killers, all of you! I'm not letting a single one of you scumbags near me! Sasuke is a somewhat smug yet caring person with the title of Ultimate Concierge. He is very slick and sometimes sweet, going out of his way to further his help of others. He is proud to be a smooth ladies man, though this aspect of his character breeds conflict with some of the other men as he always has a bias for women. He should speak in a very confident, charming tone, with a mid to low pitch. He is able to sound suave in almost any situation. 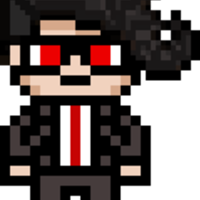 By popular demand, the canon voice that he is most similar to is Teruteru Hanamura. (Suave) The name is Sasuke Akashiro - the Ultimate Concierge, at your service. Charmed, I'm sure. (Flirty) Ah, I apologise that you have had to experience such troubles, Miss Takahashi. (Polite) If only I could assist you, ladies... Is there anything I can do? Masahiro has the title of Ultimate Engineer. He's extremely sweet, and always tries his best to assist the class with his inventions. He's an innocent man with a loose grasp on the idea of evil, always attempting to solve problems with insane new creations. His wide heart and mind make him a strong asset within the group, but he seems to be brought down if his unrealistic blueprints fail. His voice should be low and his tone should initially be very excited. His pace changes a lot with his mood. By popular demand, the canon voice that he is most similar to is Gonta Gokuhara. (Optimistic) Hey there! I'm the Ultimate Engineer! Oh, my name is Masahiro Honda! Sorry, I get a little carried away... but it's nice to meet you! (Surprised) What, huh!? I would never dream of hurting them! Tarou is a stuck-up, insufferable narcissist. Bearing the title of Ultimate Tailor, he is a Japanese celebrity hailing from England. Little is known of his past, besides the fact that his skills allowed him to skyrocket through his ranks until he reached the very top of couture and travelled to Europe. His clouded history and strong appearance paint him as a dark horse among his peers, and his public front as the 'perfect man' pushes the sales of his suits with one ideology - if you dress like Tarou, you could be like Tarou. He speaks in a medium-to-low-pitch voice with a very condescending tone. He also has an English accent, otherwise referred to as the 'BBC dialect', but this doesn't override the way that he speaks (please don't play up the cockney stereotype, remember he's going to be a voice that you can comfortably replicate for however long he is within the game). 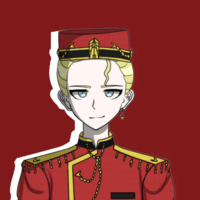 By popular demand, the canon voice that he is most similar to is Gundham Tanaka. (Narcissistic) You have been blessed with the presence of your superior - Tarou Satou, the Ultimate Tailor. It is... unfortunate... to make your acquaintance. (Sharp) Listen here, you snivelling piece of filth. Explain yourself immediately or face the consequences. (Smug) Well, I guess we'll just have to resort to murder then... A pity, really, I'd hate to get blood on my suit. Rikka boasts that she was raised at sea, ascending the ranks of her crew to become a great Ultimate Pirate. In reality, she's the Ultimate Navigator, but she'd threaten anybody that pointed this fact out with walking the plank. She's obsessed with the pirate aesthetic and lifestyle, even replicating their typical way of speech. She's loud, proud and unpredictable - with Rikka, it's impossible to predict what she'll do next. Her voice should be in the mid to low range, slipping in and out of a stereotypical fake pirate accent. She is extremely expressive - typically overjoyed or furious, and when she feels hurt or scared the pirate schtick seems to collapse entirely. 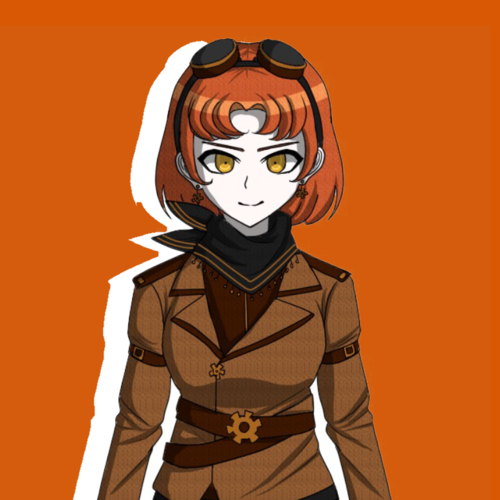 By popular demand, the canon voice that she is most similar to is Akane Owari. (Boisterous) Avast ye mateys, the pirate queen has arrived. Bow down to Captain Tachibana... and surrender ye booty! Bahahaha! (Angry - losing grasp on the pirate schtick) Ye landlubbers- you- HOW DARE YOU ACCUSE ME OF MURDER? (Freaking out) A killing game? Y-You've got to be... uh... pulling me leg! I WON'T END UP IN DAVY JONES' LOCKER! 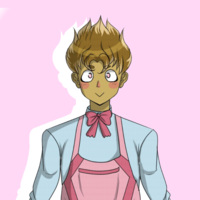 Teijo is a teen with a striking resemblance to a young child, tying into his talent as the Ultimate Prosecutor. He uses his cute looks to lull the defence into a false sense of security and to win favour from the judge and jury. This somewhat immoral method of work has released a handful of innocent people from prison... as well as hundreds of guilty criminals. His real moral compass and sense of justice are left somewhat clouded, as he seems to be morally ambivalent. One thing is for sure - he would do anything for money. 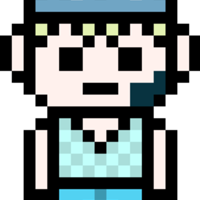 Teijo's voice should be high-pitched with an extremely childish and playful tone that turns dark and condescending when he is irritated or angered. By popular demand, the canon voice that he is most similar to is Kokichi Ouma. (Childish) Hi! The name's Hanazawa! Well, they call me Prosecutor Hanazawa, but you can call me Teijo! Here's my card. (Condescending) Oh, please. A class trial? With a jury of our peers? These morons aren't my acquaintances, never mind my peers! (Offended) Me? A killer? I defend murderers on a daily basis, I could never commit a murder so sloppy! Kami is a hopeless romantic with the talent of Ultimate Screenwriter. She has a special place in her heart for love subplots and is not at all subtle in letting everybody know that she is looking for her 'prince'. She seems to blur fiction and reality at some times, accidentally misremembering television plots as her own past or recalling embarrassing memories as soap opera narratives. She's a bit of a ditz, but has a confident and positive head on her shoulders, and she refuses to let anyone drag down her dreams. A high pitch and peppy tone should be core aspects of her voice. She sounds like very 'basic' and easily slips into cheery rants. 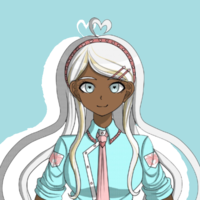 By popular demand, the canon voice that she is most similar to is Aoi Asahina. (Optimistic) Hey there! Screenplay extraordinaire Kami Yukimura here! Nice t'meetcha! (Terrified) What do you mean, 'killing game'? I mean, I know it's self-explanatory, but I'm just hoping for some deus-ex-machina! (Offended) Kill them? I barely even knew them! I'd never lay a finger on someone so charming anyway! Tora is an extremely friendly and personable woman with an extensive knowledge of show business, initially being hired to translate the sign language of the mute Ultimate Percussionist, Ringo Enokida. This overexposure to 'the biz' wore down at her sweet side slightly, and though it is rare, she is toxic when agitated. She gained fame even amongst her peers for being one of the rare few to gain an Ultimate title alongside a close relative or friend. The headlines even display herself and Ringo as a 'power couple', a rumor perpetuated in Maeko's tabloids. She should have a medium-pitched voice and speak in a charming, professional tone, but be able to 'explode' when she is angry. 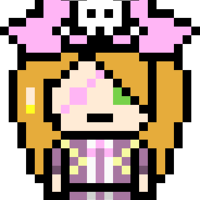 By popular demand, the canon voice that she is most similar to is Mukuro's Junko Enoshima impersonation. (Charming) Willkommen, ma copine! Tora Chiba, Ultimate Translator. Oh, no, the pleasure is all mine! (Sharp) Dimwit? I speak more languages than you have tailored garments, Mister Satou, and I would politely request that you refrain yourself from ever presuming anything about me again. Do you understand me? (Condescending) Sweetie, would you kindly take that waste of time somewhere else? The adults are talking. Though publicly seen on television as a bright and cheery individual, Tsunade actually has a much less explosive personality in real life. She tends to be very dull and fades into the background in conversations, which gives her a feeling of loneliness, and though her loud and crazy sound is present, it is heavily repressed. Secretly, she wishes she could be in the spotlight with everybody else, but her negative mindset just won't allow it. She is easily frightened and spends a fair amount of her time anxious or in a depressed state. 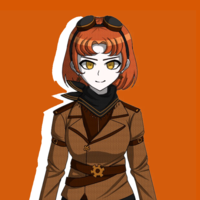 However, she has the drive within her to work towards escaping, which is her main goal as the Ultimate Demolition Expert. Her voice should be mid to high pitched and dull. She is generally soft-spoken, but yells and cheers when losing her reservations or being in an excitable state. 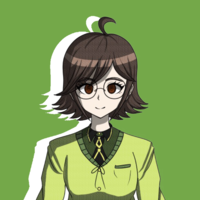 By popular demand, the canon voice that she is most similar to is Chihiro Fujisaki. When momentarily loud, she sounds more like Miu Iruma. (Dull) Yup, this door is welded tight. I'd need some powerful stuff to blow this baby open. It might be a smarter decision to try blowing up one of the metal plates covering the windows. (Scared) K-K-Kill each other? I don't want to die... P-Please don't make me die! I'm scared! With the skill of Ultimate Optometrist, one would expect Ayeka to have perfect vision. She is, however, colorblind - her colorblindness glasses were what initially made her so famous. She is aware of the platform she has and uses it to speak out against social issues, but without her 'hero of the people' facade, she's immediately rendered timid and awkward. Among the students, she is very shy and tries to avoid attention. Ultimately, she wishes she could make big changes with none of the fame, but knows this is unrealistic and so pushes on anyway. Ayeka has a very passive personality, leading to her mousey demeanor. She is extremely speedy and quirky despite this, and is prone to gossip and pry. She has an odd skill for seeing through white lies, but is totally oblivious to the greater bullying and deception happening right before her eyes. She should have a high pitched voice, fluctuating in tone between being momentarily confident and extremely bashful. 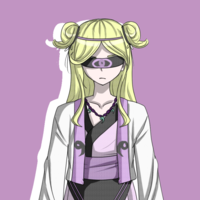 By popular demand, the canon voice that she is most similar to is Mikan Tsumiki, or Miu Iruma's pushover tone. (Timid) Ah... hello, my name is Ayeka Shimizu, Ultimate Optometrist. It is wonderful to make your acquaintance. (Dejected) Why are we here? It's not like we did anything bad - we're all good people, I know we are! So... why do we have to kill each other? Junpei is not as kind as he is a pushover. He's ridiculously generous in the way that he would give all of his belongings at the drop of a hat for someone in need, and this often gets him into serious trouble and debt. Baking is one way for him to raise money and assist the people around him, and once he set his skills to work, he quickly flourished as the Ultimate Patissier. It is rumored that he primarily accepted his invitation to Seigi Academy simply to escape his financial problems. His voice should be mid ranged, often laughing and trying to be the voice of calm and reason. 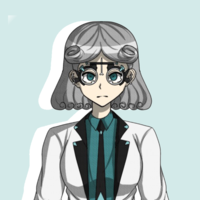 By popular demand, the canon voice that he is most similar to is Yasuhiro Hagakure. (Joyful) Hey there! Maeko Takahashi, right? I love your articles! Junpei Fukuhara, Ultimate Patissier. It's so cool to meet you! (Sincere) We don't need to turn on each other, guys. I don't want any conflict. I'd prefer not to die but please, if anyone has to, just make it me so everybody can get this over with and escape. Kage is the only student within the cast to not have a talent. He himself is very open about the fact that he is a NEET and actively avoids even being known to exist. He is cocky about tiny achievements, has a short fuse, and is often treated as a joke by the other members of the game. He assumes the role of the "joke" character and has a strange quirk: he is not actually within the school. He communicates with students through a remote-controlled two-way camera on a pole with wheels. He is actually locked within an apartment stocked with rations, though he has no clue where this actually is nor the mastermind's motives for including him in the game. However, his life is on the line alongside everybody else's in trials, as nonchalant and smug as he always is. His voice could really go in any direction. It would be interesting to see personal interpretations. Only a small amount of things stay consistent: his high volume and expressive tone. 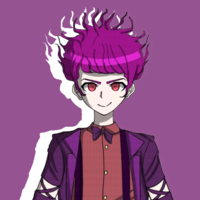 By popular demand, the canon voice that he is most similar to is Kaito Momota. (Angry) HEY! WHO THE HELL ARE YOU AND WHERE AM I? (Bewildered) Me? If you must know, the name's Deguchi. Kage Deguchi. As for a talent, I don't have any so your guess is just as good as mine. (Agitated) HEY, I'M NOT A DAMN COMPUTER, OKAY!? STOP RUNNING! I CAN'T ROLL THAT FAST! Monobaku and Nijibaku are learning A.I. 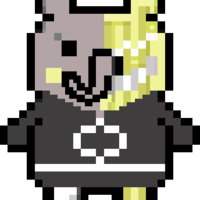 in the form of bipedal tapir sisters. Their primary roles are to care for and ensure the safety of the students whilst they are on the premises of Seigi Academy. They have control of most everything inside of the school and use this to protect their class. they assume a teacher-like role despite the fact that they are just school mascots, but have good connections with the students. Nijibaku's voice should be very high and playful, probably with a childish tone as she tries to bring joy to her classmates. She should sound more female than male, though this does not mean that men are not welcome to audition for the part at all. Monobaku, being the darker of the sisters, does not need to sound entirely malicious, as the voices should sound similar, though should be distinguishable. The best way to do this may be to toy with pitch. Improvisations to test the distinguishable differences are 100% welcome. By popular demand, the canon voice that they are most similar to is Monomi. (Cheery - Mono) Hello, hello! I am Monobaku, your one-stop assistant to cater to your every need! Please call me if an inconvenience arises. (Scared - Niji) K-K-K-KILLING GAME? NO! I-IF YOU STUDENTS MURDER, I'LL FAIL YOUR CLASSES FOR THE NEXT THREE YEARS! (Offended - Niji) Elephant? That's a new insult... hey, wait! I'm not an elephant! I'm a tapir for your information, sir! I didn't work to get this summer body just to be called an elephant! People willing to help with the OST (note: this position will not be given any spoilers, things will be kept vague), ranging from custom character trial themes to credits music to the Danganronpa theme tune remix and everything in-between (or just one specific thing, if that's what you prefer).